The Hult Prize, the world’s largest student competition for social good, is for the first time also represented in Estonia. Estonia is known worldwide for its robust technology and a growing startup ecosystem. The entrepreneurial talent pool here is immense, which gives rise to the levels of creativity and innovation in this country. After more than eight years of successful operations worldwide, in more than 100 countries and 1,000 universities, including the Ivy Leagues in America, the Hult Prize Foundation is bringing its impact engine to Estonia. Established in 2010 by the Swedish businessman, Bertil Hult, and partnering with the Clinton Global Initiative, the annual, year-long competition crowd-sources ideas from MBA and college students, after challenging them to solve a pressing social issue. The general idea is to unlock the desire of young people to change the world through business and look for that disruptive idea that has the potential to create impact globally. In nearly a decade, the movement has mobilised more than one million young people for the cause – prompting the Time magazine to feature it among the “Top 5 ideas changing the world”. By setting its base in the Estonian Business School (EBS) – a top tier business school in Estonia – the Hult Prize Foundation plans to expand further to different universities and campuses in the country by next year to foster the growth of startups. The competition at EBS is the quarterfinal round of the annual US$1,000,000 Hult Prize challenge. It gives the winning team the chance to bypass the general application round, and fast-track into one of the 15 regional rounds. One startup will be chosen from EBS to not only represent the university itself, but also the entire country at one of the regional rounds. Regional semi-final rounds of the competition will be held in Boston, San Francisco, London, Dubai, Shanghai, Toronto, Mexico City, Quito, Bogota, Melbourne, Lagos, Nairobi, Cairo, Tunisia, Kuala Lumpur and Singapore on 09-11 and 16-18 March in 2018. The top regional winners will be invited to an eight-week summer accelerator in the Hult castle in the UK, which will give them access to the top tier founders, executives and investors in the region and conduct market research in the different regions. Six startups will be chosen from this round to present their idea at the United Nations HQ in New York City in September 2018 in front of the global leaders such as the former president of the United States, Bill Clinton, who announces the Hult Prize global winner each year. The general idea is to unlock the desire of young people to change the world through business and look for that disruptive idea that has the potential to create impact globally. This year’s challenge is “Harnessing the power of energy”. 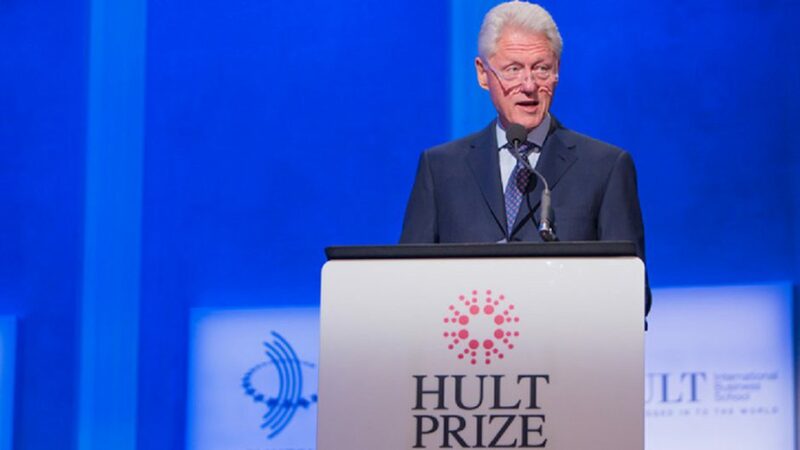 The Hult Prize states that entrepreneurs who have an idea that is related to any one of the following sectors: connectivity, mobility, health, water, education and agriculture are eligible to apply for this year’s competition. Previously, the prize has been won by teams all around the world, so your team could win the Hult Prize 2017 – let’s show the world what Estonia has to offer! Students in Estonia, who have a startup idea and a team of three-to-four members, can register on the Hult Prize website to take part in the competition and have the opportunity to win a prize worth US$1,000,000 in seed capital. The deadline to apply is 17 November 2017. Cover: Bill Clinton (the image is illustrative). Saniya Vardak, a young entrepreneur from Pakistan, previously co-founded a startup called Daastan and, having experience in working with startups locally and internationally, she currently is the director of the Hult Prize at EBS. With her passion for writing and entrepreneurship, she plans to contribute more to the startup community in Estonia as well as internationally.